There are so many ‘mindsets’ on grooming that’s it’s best to research all and find what works for you. I am sharing mine here. 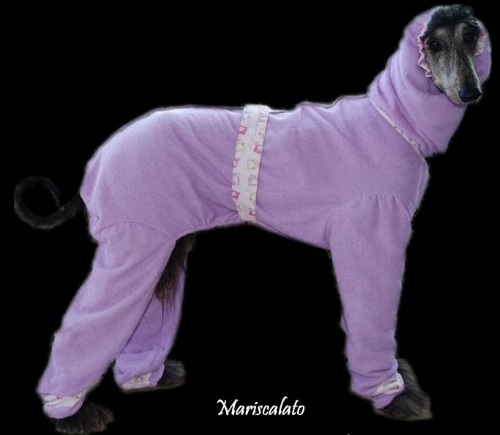 I am not the end all of Afghan Hounds, nor self professed Afghan Hound expert – but willing to share my experiences. Grooming Schedule: Your grooming schedule can be variable, depending on how much coat they have, the environment, the time of year. For Afghans in full coat I would recommend a bath every 1-2 weeks. For clipped down about once a month is sufficient. When to Groom: I will give mine a full groom only AFTER a bath. I never brush on a dry, dirty coat. I will hit the matt areas and brush them out prior to the bath to ensure the hair in the matts is untangled and able to get clean during the bath. I will spray with a finishing spray of some kind prior to brushing out the matts. Norma’s Recipe -Norma Jean Johnson Stewart – My Mixture I use that I make my self of, in a 32 oz spray bottle, one heaping tablespoon of cholesterol (found anywhere in hair products for humans), 1 tablespoon of Suave or Frutis sleeking conditioner (found in hair care isle anywhere for humans, 1-2 tablespoons of Morrocan Argon oil (found anywhere in hair care isles ( does not matter which one all the same so cheapest is best on pocket book), and 1 tablespoon of CHI Silk Infusion which is found in hair care isle for humans and even at Wal-marts (grey bottle with red lid)…….now fill bottle with hot water to dissolve cholesterol so shake it til mixed……….this a great item, I have hardly ever any tangles since I use this, no matts at all…..and great just to freshen up the appearance also between bathing…….great for static, shine , great fragrance also…….if you try it let me know what you think……..I love it…..depending on your hounds coat texture and thickness you may need more Argon oil in the mixture, but it is something to play with to meet your need…. If you use one with heavy conditioner you may find the matts returning quicker as some of the heavier products work as a magnet to attract the dirt – so the lighter the better. 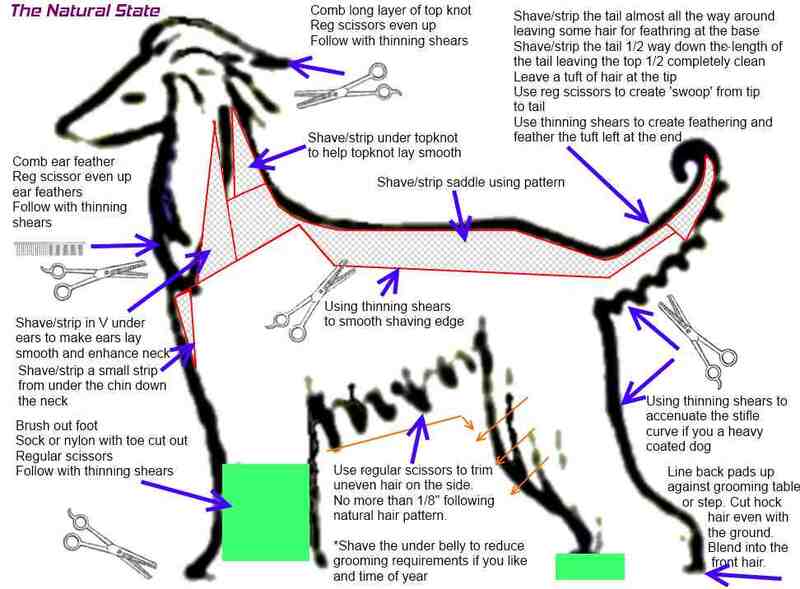 Time Limits: As Afghan Hounds should be able to tolerate their grooming sessions for the entirety of their lives I try hard to make it as pleasant as possible for them. We do short sessions, followed with treats and praises (regardless of how long they have done it). I try not to go for more than an hour at a time. Grooming table, stand dryers, crate dryers, etc: Some say you need grooming tables, stand dryers, crate dryers, etc for an Afghan Hound – I’m not sure you need all that. I have all those because I have shown before, but for our normal maintenance grooming, I will bathe, put the in the crate lined with towels to dry or wait until they are semi damp (if it’s nice out) , then groom by having them lay on the couch or bed while I turn on the TV. I do have a crate dryer that I will put them in a crate with a blanket over the crate and turn the dryer on. I do not point the dryer at them but at the back of the wall so you get the wrap around heat to do the drying. I will check them every 15 minutes and sometimes adjust the wind flow. Rarely do I leave them in there longer than 30 minutes. 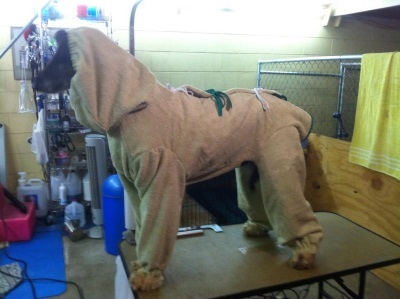 I will sometimes throw them up on the grooming table to go over the final round to make sure I got everything – but when I didn’t have a table I would put a leash on them and attach to a kitchen table leg. 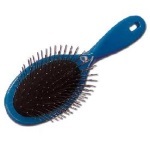 Brushes – I prefer the ones with the softer rubber as my dogs will stand still better for me. If the brush is too hard, it hurts and they are uncomfortable. Try to find a brush they will tolerate. Bass Copper Pin Brush – The copper pins are great for reducing static and depending on the time of the year (usually winter) will reduce static as a final go over. Their favorite slickers – #1 All Systems – D1 Slicker Brush I usually have a small one for doing those matts between the toes and a large one to cover more ground. Work in layers starting at the bottom working your way to the top, you can use hair clips to hold up the upper layers to let you get to the bottom layers better. If brushing on the matt I clamp the hair between my fingers of my extra hand next to the skin to prevent pulling of the hair as much as possible. Spray with finishing spray OR sprinkle dry matt with cornstarch – do not use water & cornstarch unless you are making gravy. 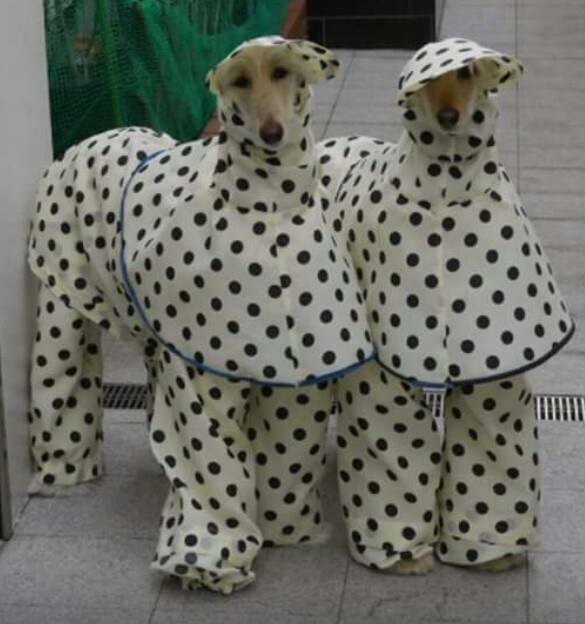 The breed standard claims Afghan Hounds should be shown in their natural state, and consider it taboo to ‘clean up’ an Afghan Hound. But everyone does it. The purist will say ‘plucking’ the dogs hair out is ‘better’ than shaving, but either way you are removing hair or thinning hair in unwanted places. To that end I put this photo together to help folks who maybe taking their dogs to the groomers and have a groomer unfamiliar with cleaning up an Afghan Hound. Final Groom Out after the bath. Once I think I have it all, I will throw them on the grooming table and do a final go over with either a slicker and/or greyhound comb to make sure I have it all.